My Crystal Auras Series features an alluring amalgam of terrestrial and otherworldly qualities. These mixed media paintings are created with countless layers of potent earth tones that permeate the sculpted surfaces. A primordial energy exudes from within the core of each painting, causing the work to feel as if it has been spawned from a prehistoric cave wall, a stratum of a familiar or distant terrain or the glistening interior of a geode. Due to my experience working with gemstones, I am adept at the manipulation of light. This allows me to best enhance the natural energy inherent in the chosen pigment, which is invigorated by the intricate geography of the surface. My recent Ricordi d’ Italia Series continues my exploration of color, light and surface. 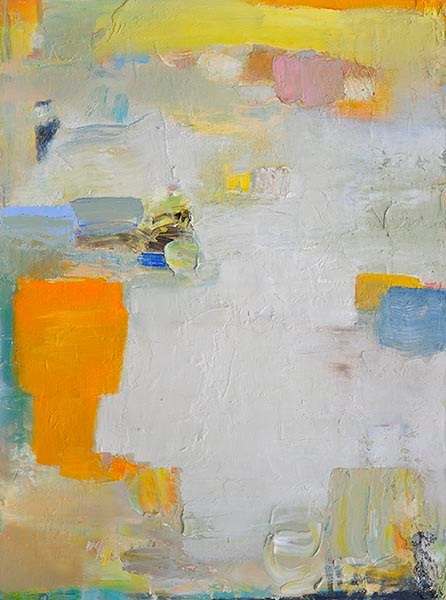 Inspired by travels to Italy’s Amalfi Coast, these paintings still have the ethereal quality of the Crystal Auras images but also include a more formalized abstraction and defined composition. The layering of surfaces and color reveal a geometry with a distinctive Modernist flair. Elements of the past and present architecture of Southern Italy’s coastal villages and ruins emerge from this abstracted imagery, producing a dreamlike mood that does not reside in a specific time or place. 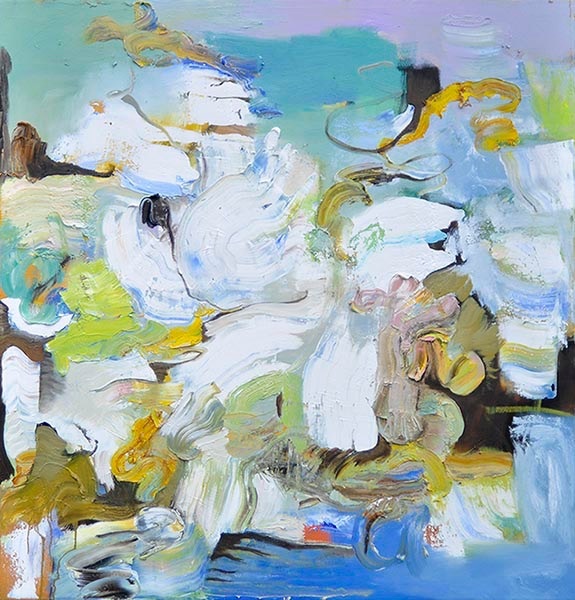 Other works utilize a more electric and pulsating palette reminiscent of the potent energy of vibrant coastal vistas. The work exudes the unique variances of Italy’s terrain and achieves an otherworldly quality through a reductive process in which the tangible is deconstructed into its essential elements. Anne B. Schwartz is a visual artist who earned a BS degree in graphic design from the University of Oregon and a diploma from the Gemological Institute of America. In 1976, she established her own business, Sculptured Jewelry Design, and had a successful career as a jewelry designer for 25 years. After taking classes in the Japanese and Chinese style of Sumai in 1992, she began to shift her focus to fine art. Subsequent studies at the Brentwood Art Center led her to concentrate on abstract painting. 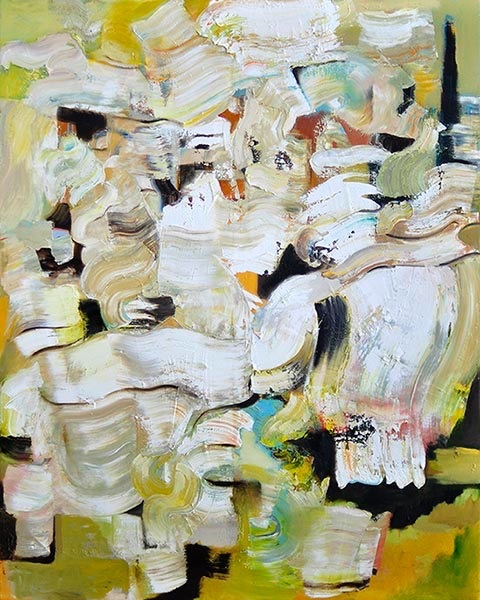 For the past two decades she has exhibited her mixed media works in numerous group exhibitions throughout Los Angeles. 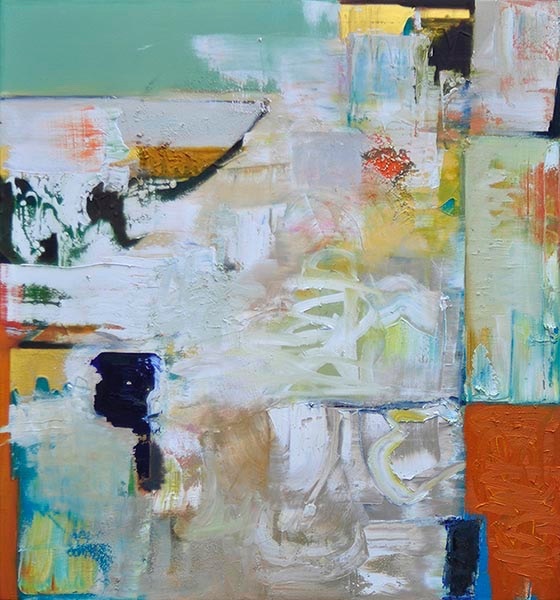 In 2010, her paintings were included in a coffee table book titled Santa Monica, featuring art inspired by this seaside city in California and published through Jeffrey Crussell Fine Art. She was recently honored as Liquitex Artist of the Month and has received several awards for her work in various juried art competitions. Giclee prints are available on line at Neiman Marcus, Horchow and other fine retail stores.